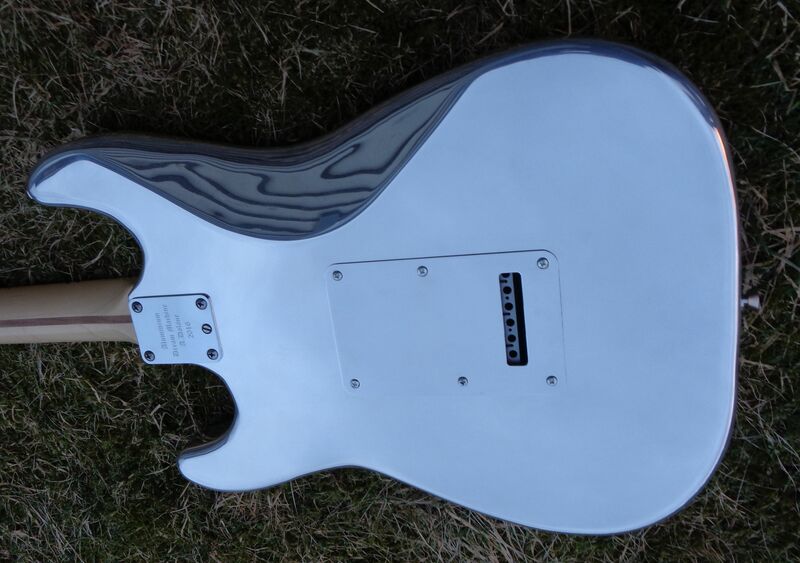 This page is meant to show all the beautiful guitars that people have built with my loaded pickguards , or the Dream Machine tremolos, or similar stuff. 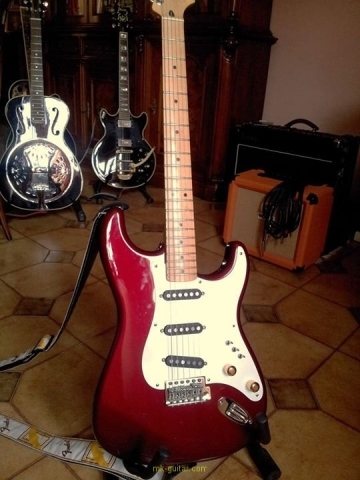 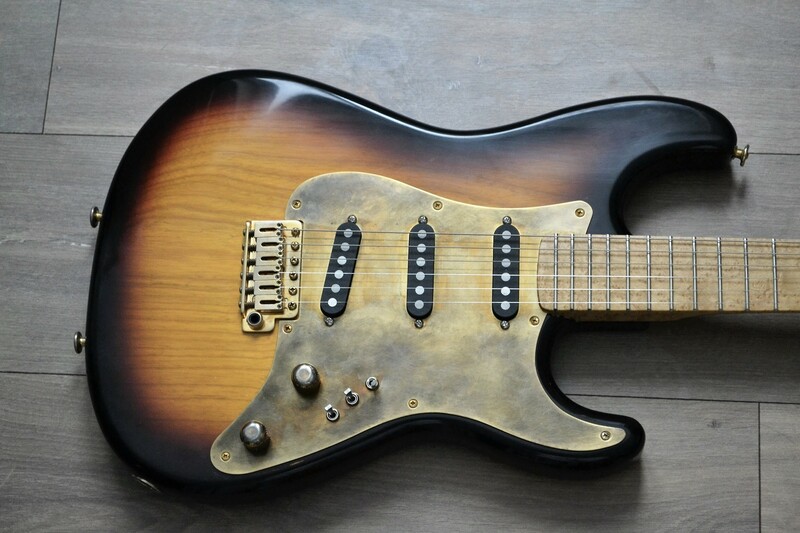 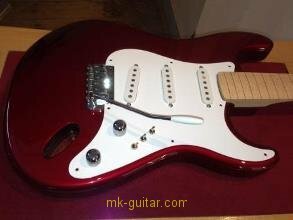 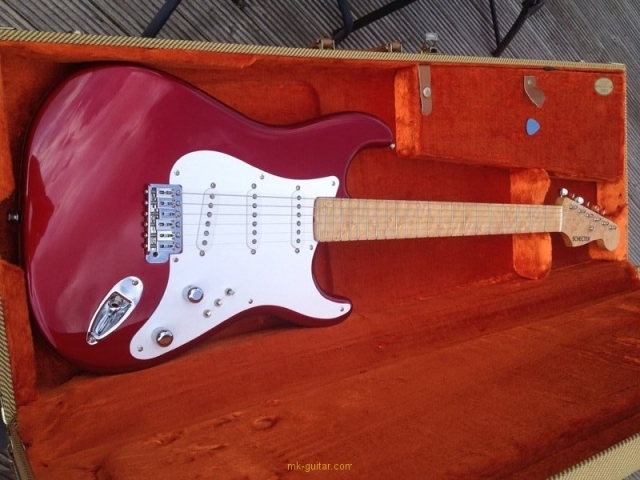 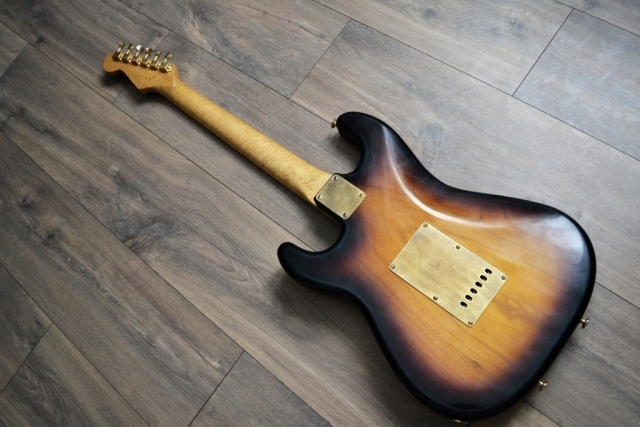 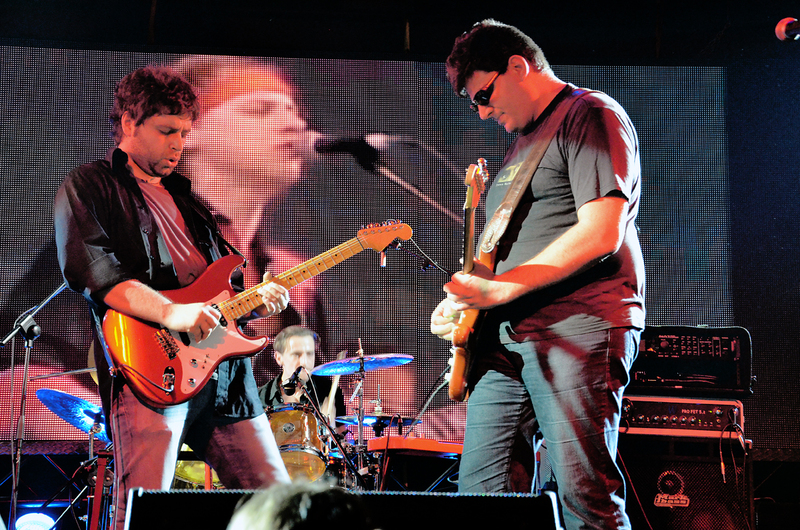 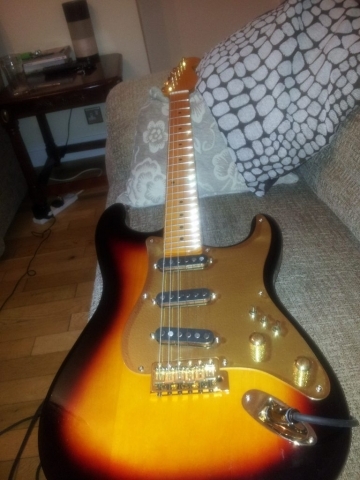 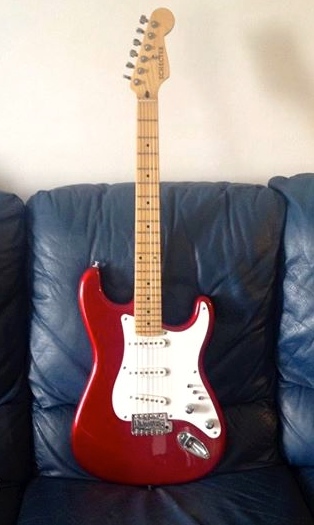 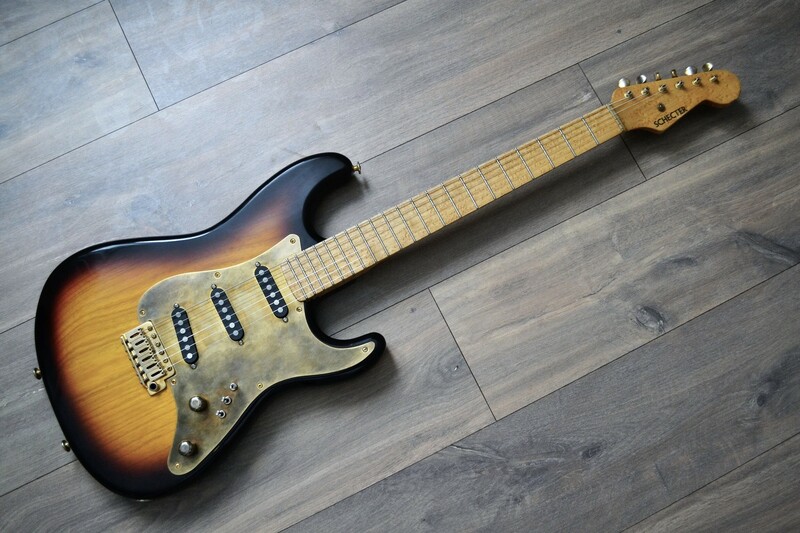 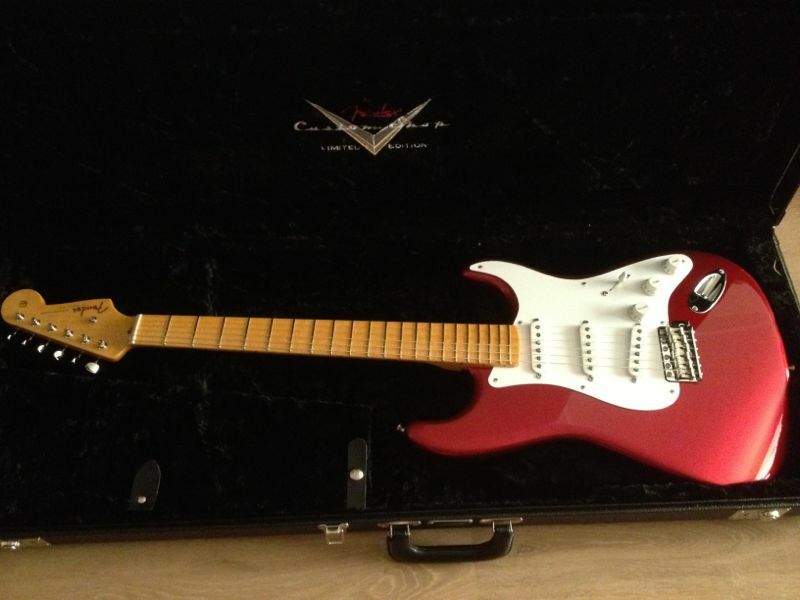 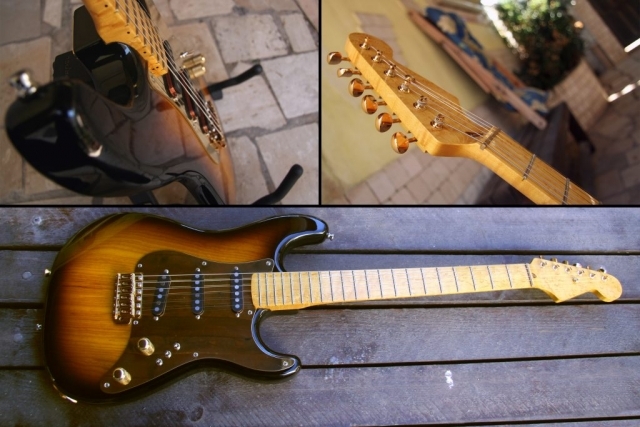 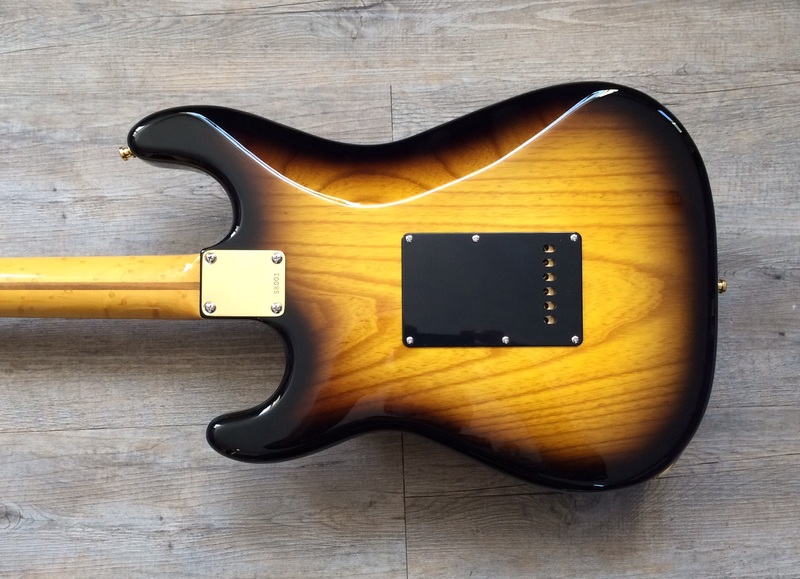 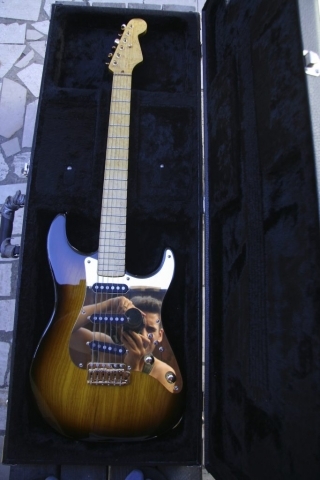 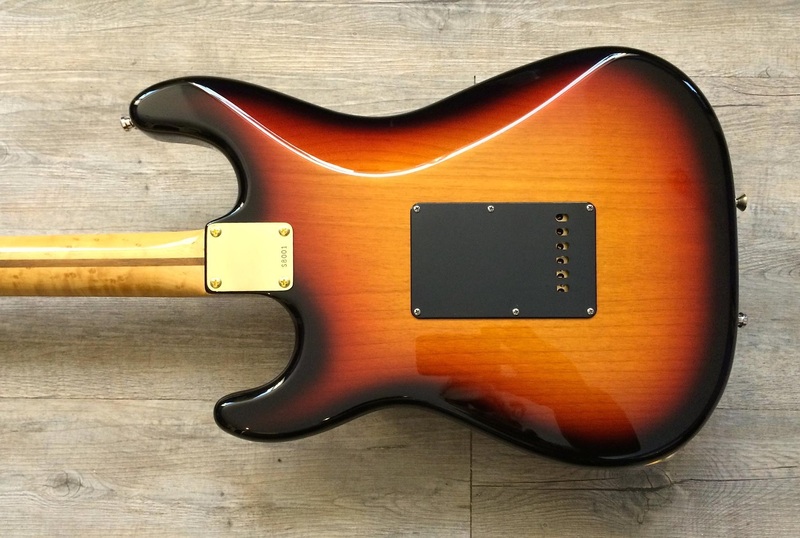 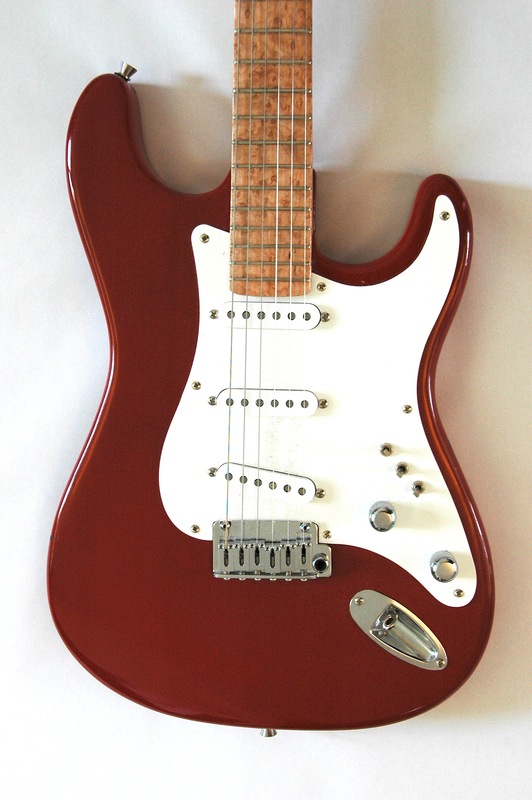 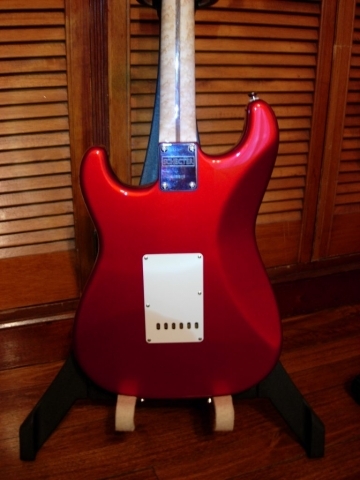 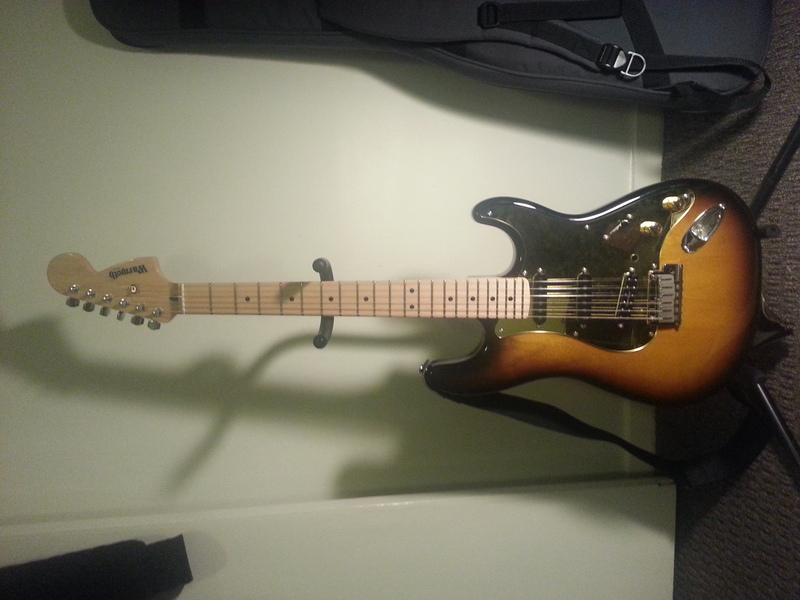 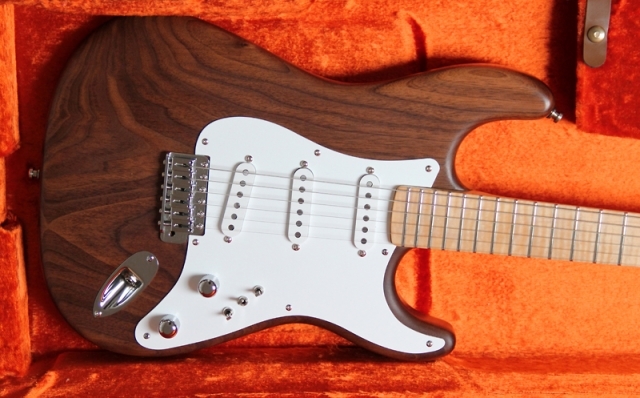 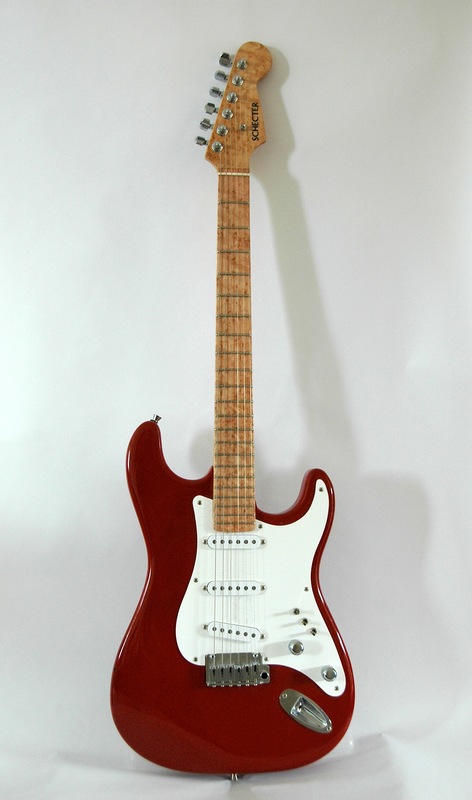 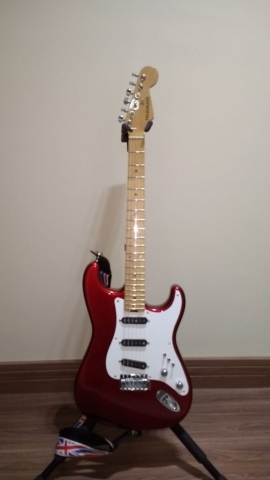 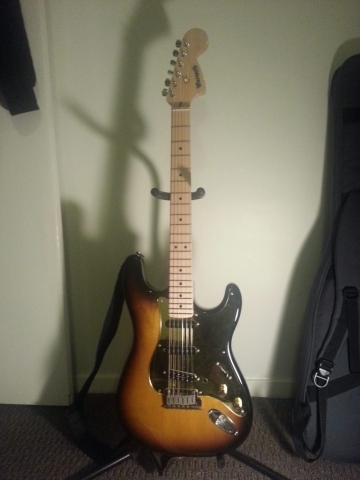 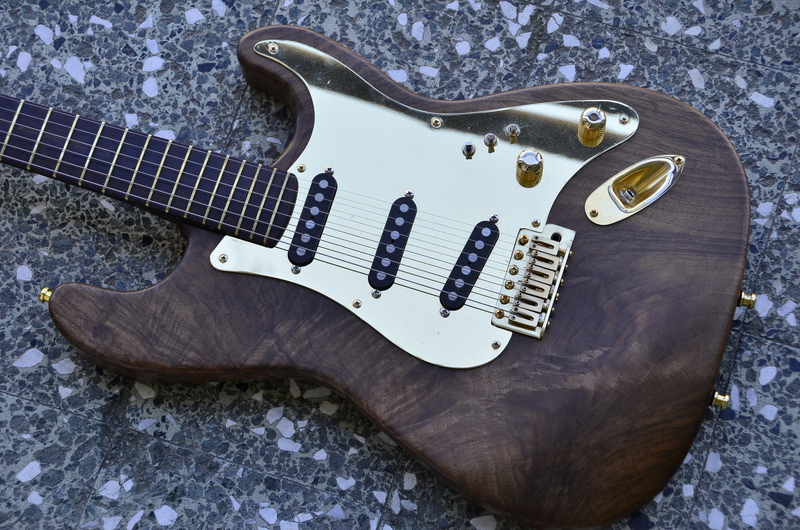 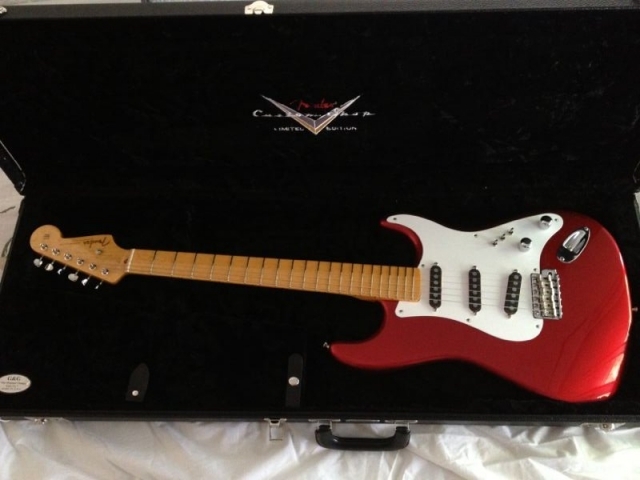 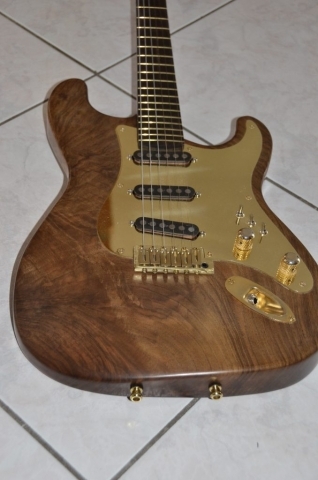 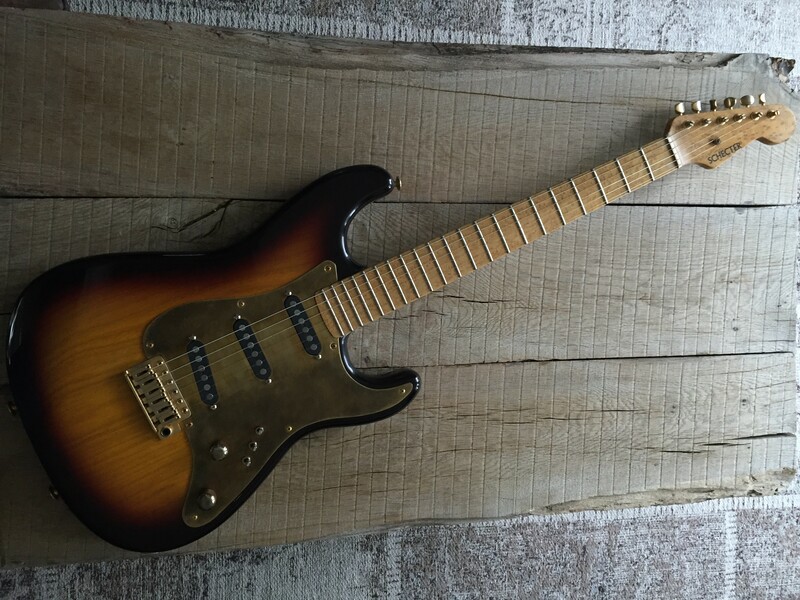 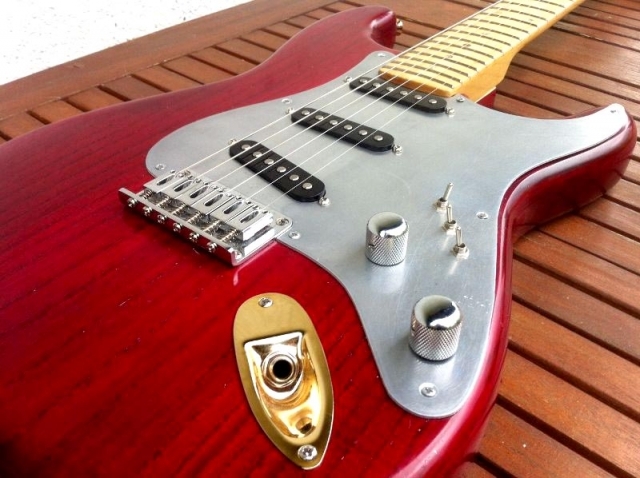 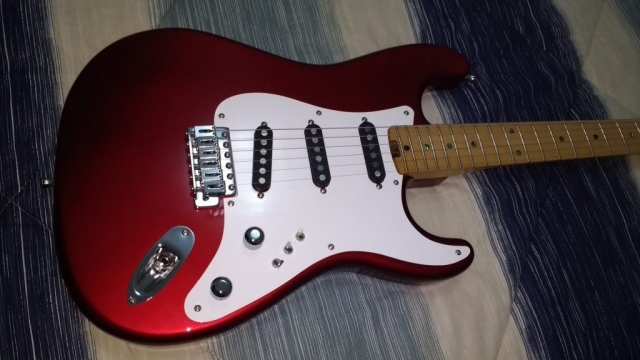 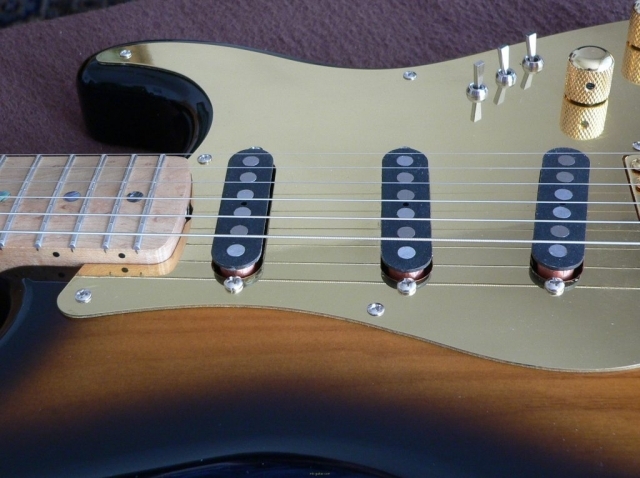 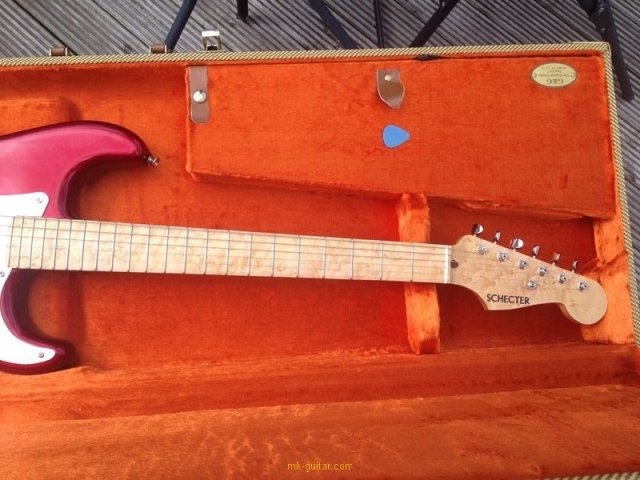 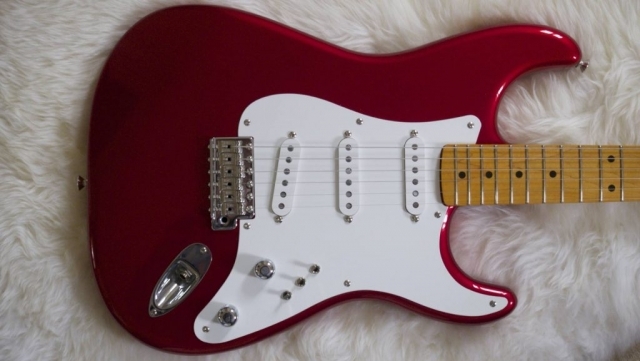 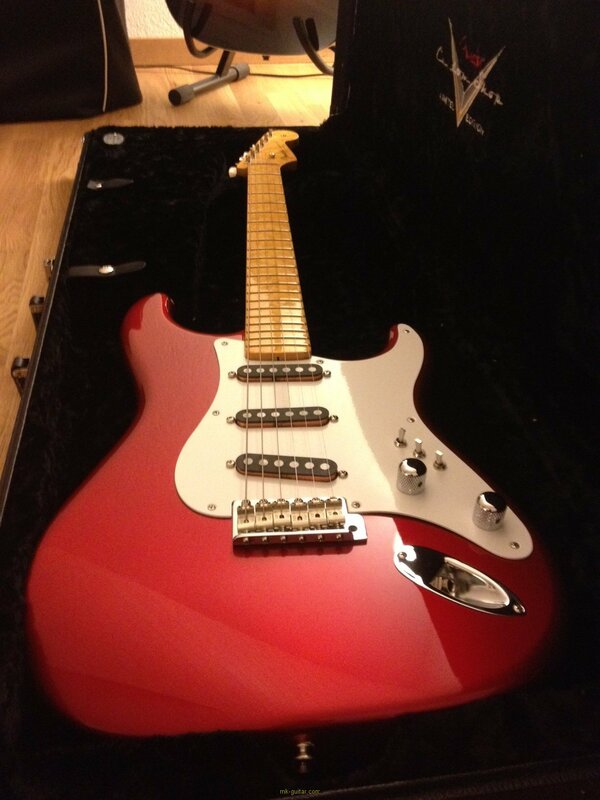 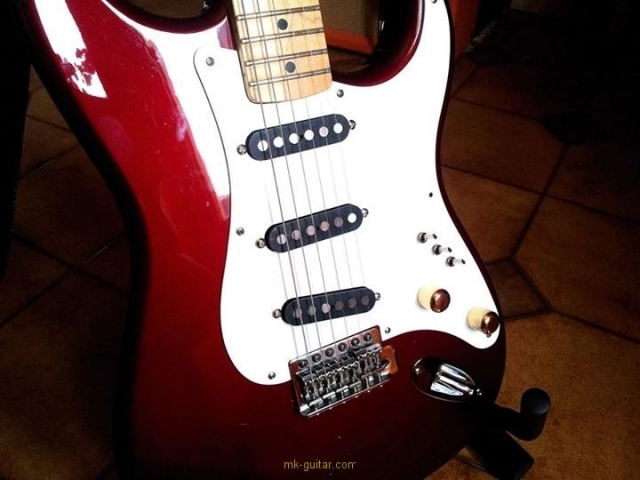 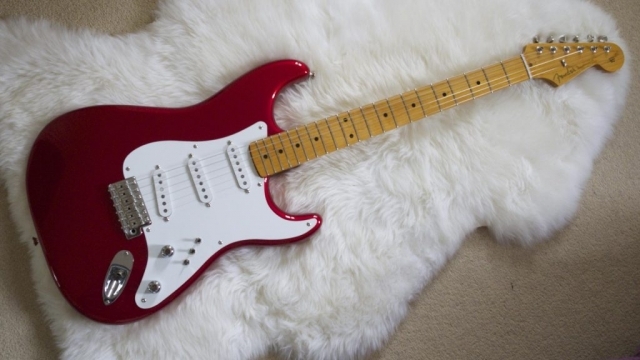 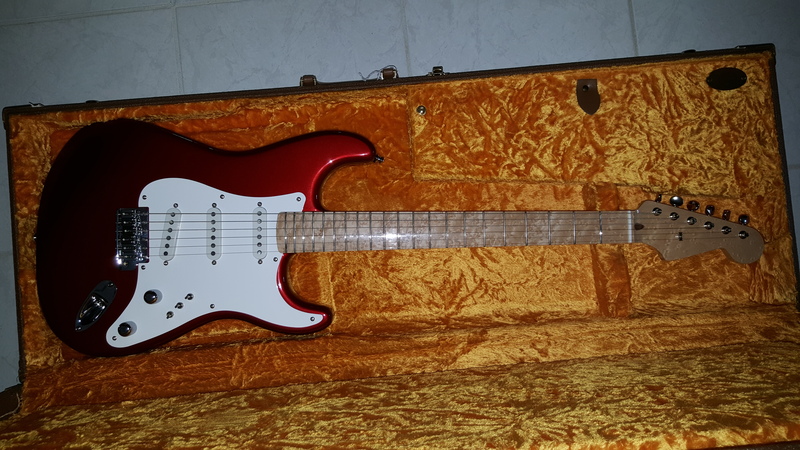 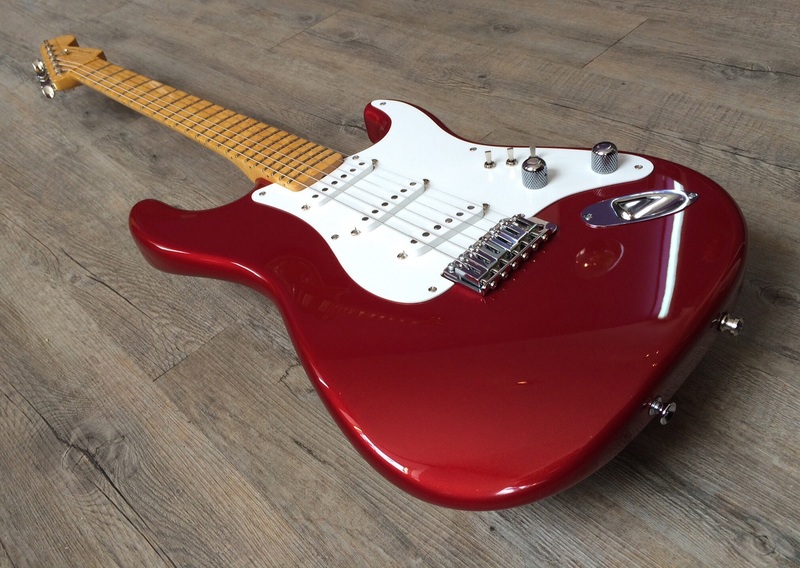 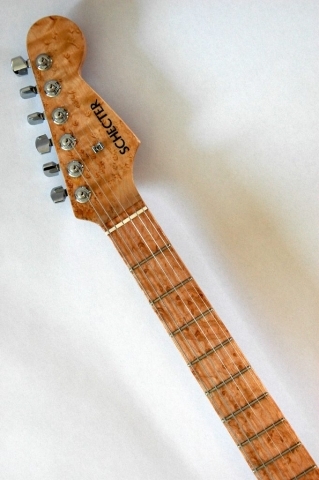 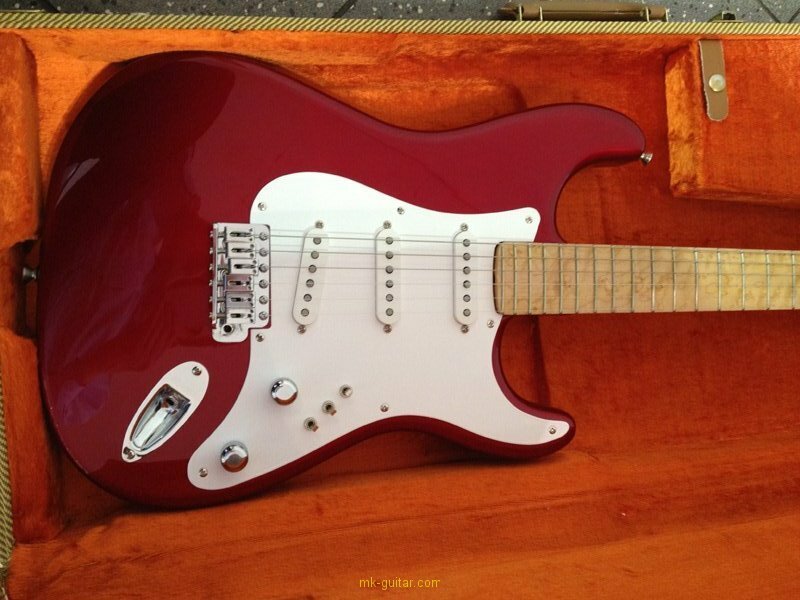 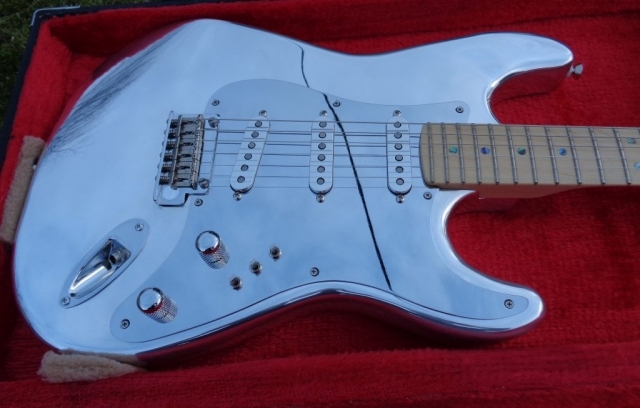 Some built themselves a replica of one of Mark Knopfler’s guitars, like the red Schecter Dream Machine, or one of the sunburst Schecters with a brass pickguard. Or they simply put it on any of their Strats to get that Schecter sound, or simply the possibility of the 26 sound combinations those three mini switches give you. 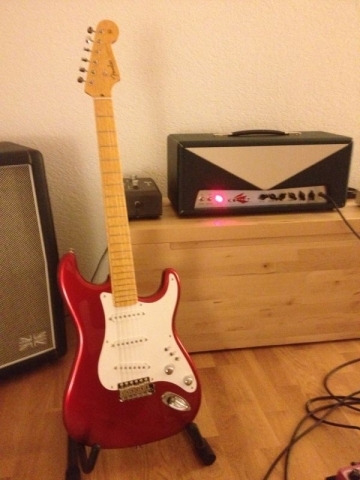 You can easily upload your own pictures here (no registration required), and add a description for each picture. 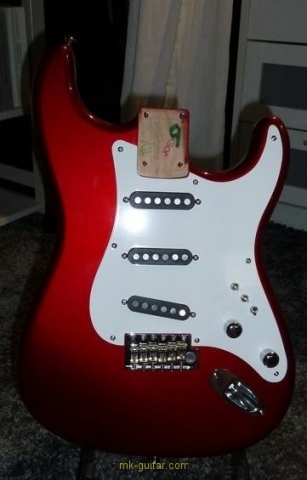 To avoid spamming, all pictures will be displayed after moderator approval. 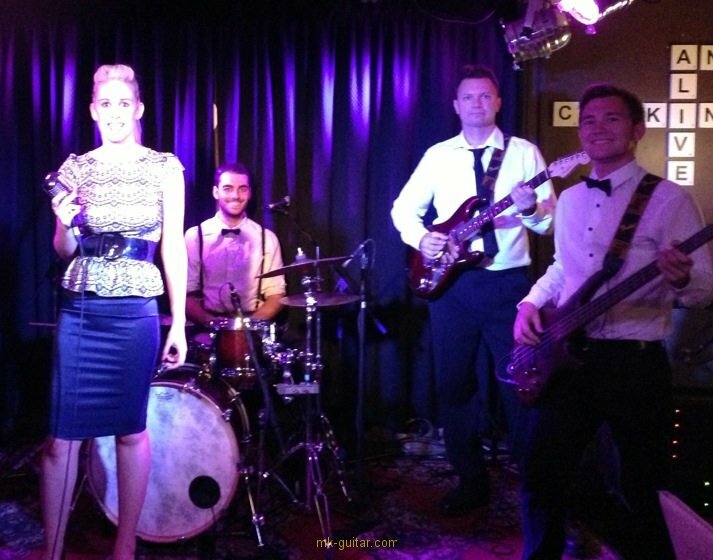 Click on a thumbnail to enlarge the picture. 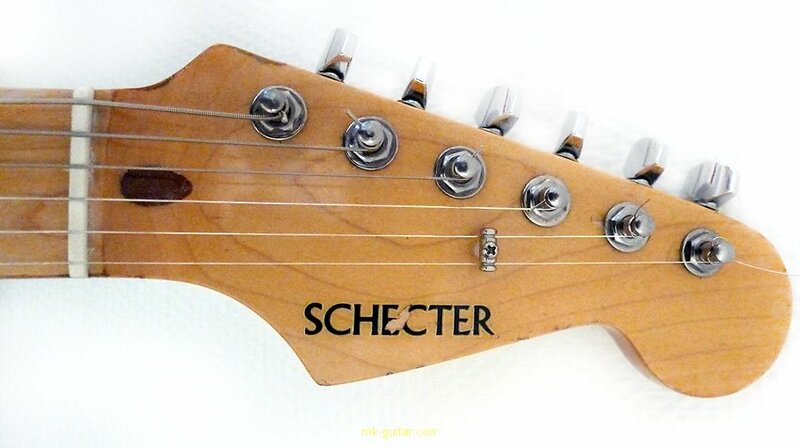 Then use the arrows under the picture (<< and >>) to go to the next or previous picture. 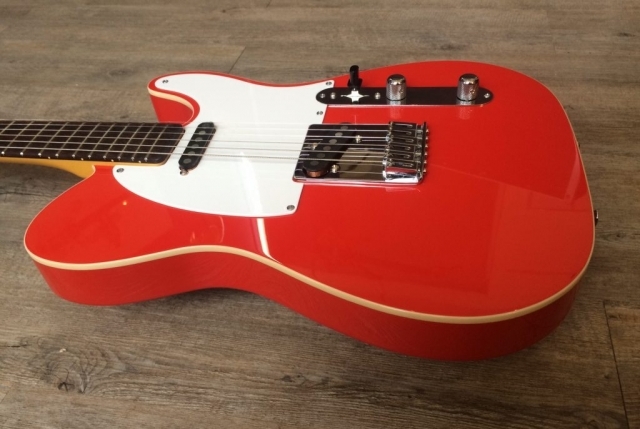 Clicking on a picture closes the gallery. 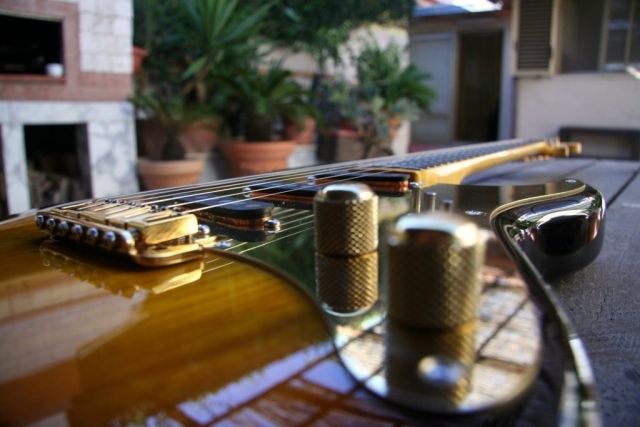 Fantastic section of the website. 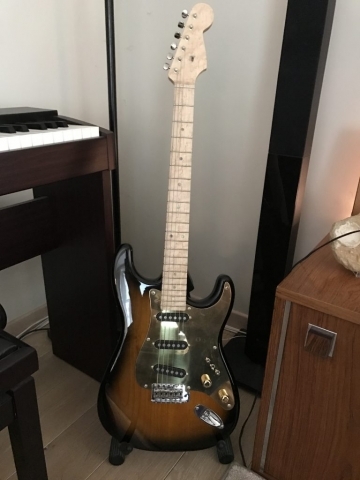 Really great to see everyone’s Dream Machine’s. 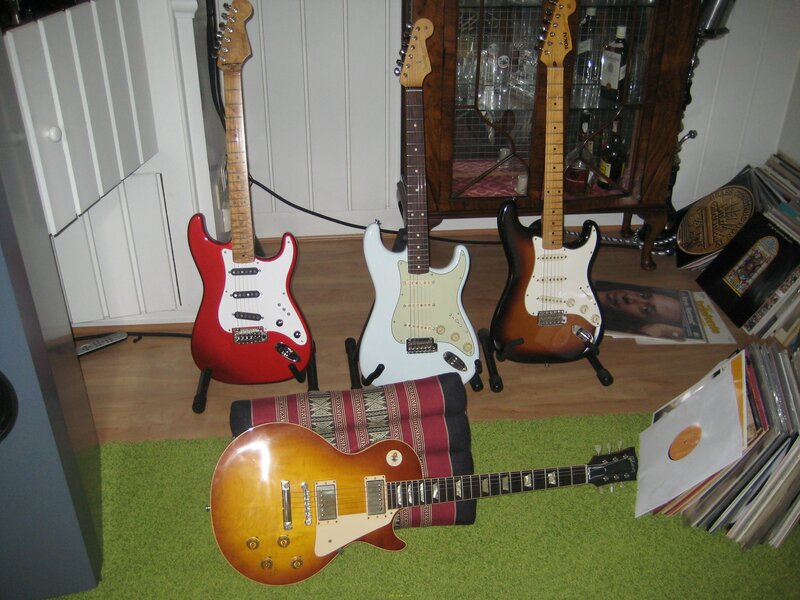 They all look superb. 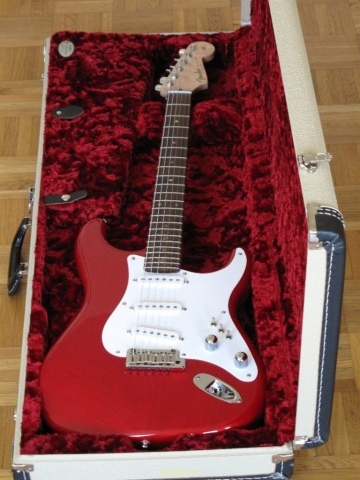 Your replica is really nice! 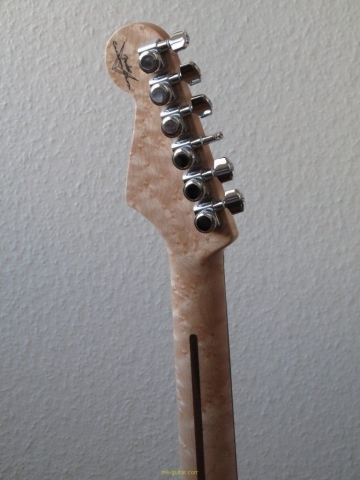 What an impressive neck! 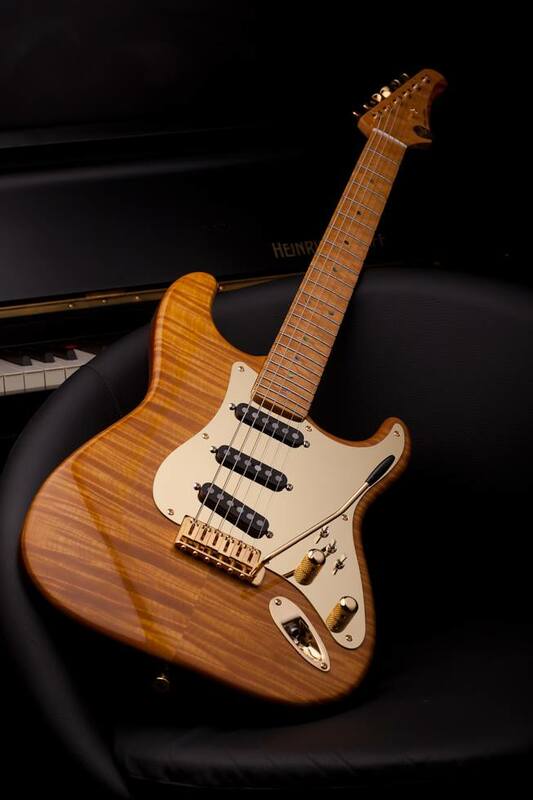 Where did you order it? 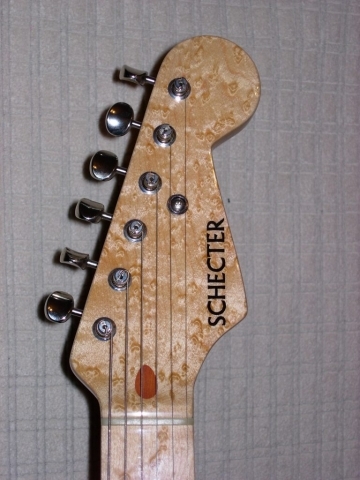 Or is it a real Schecter one? 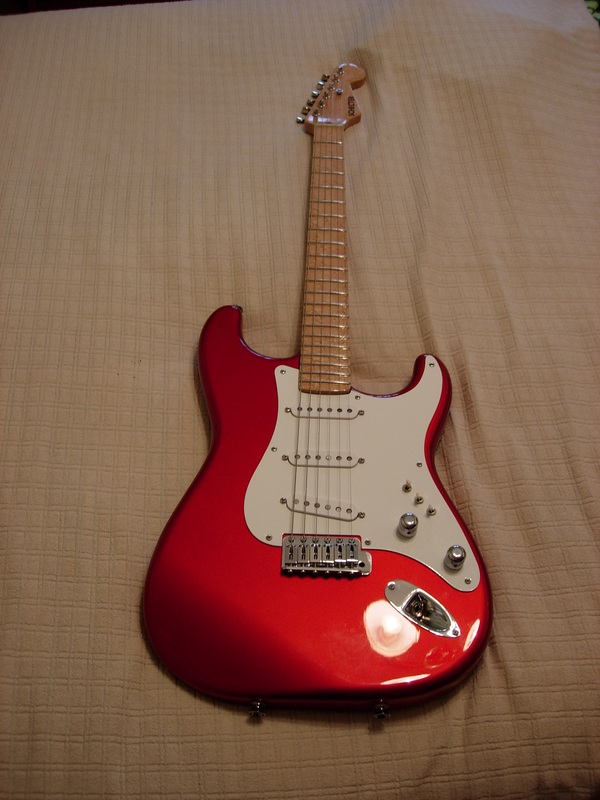 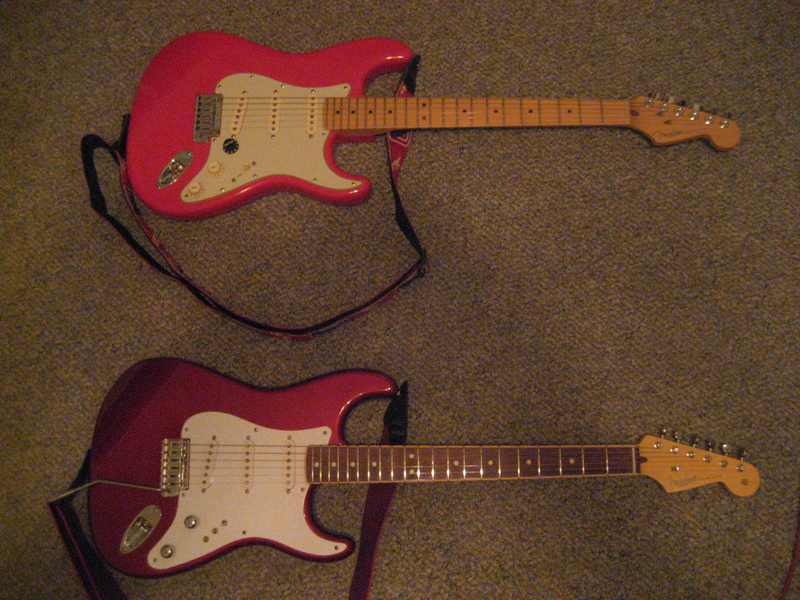 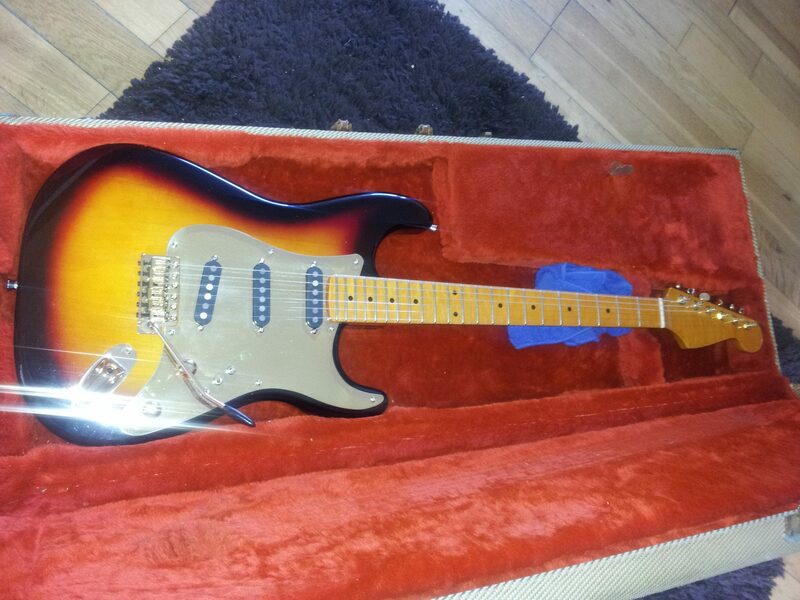 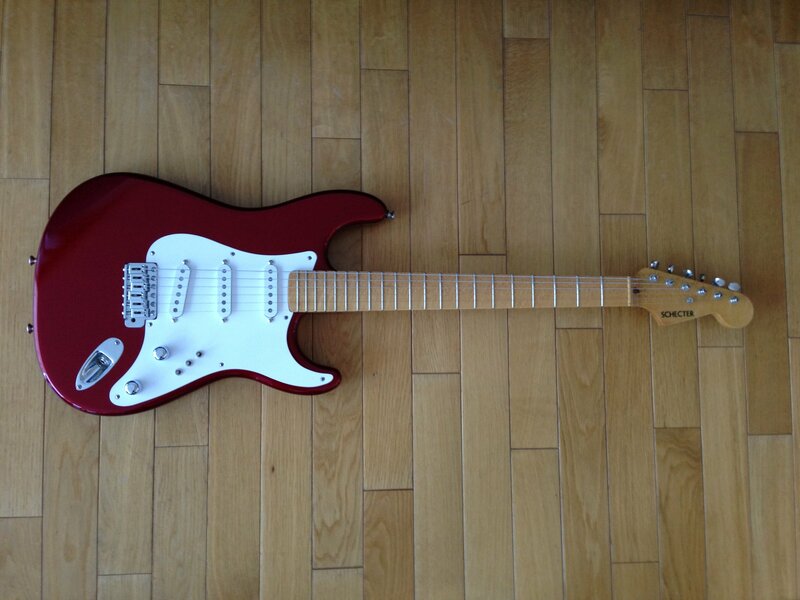 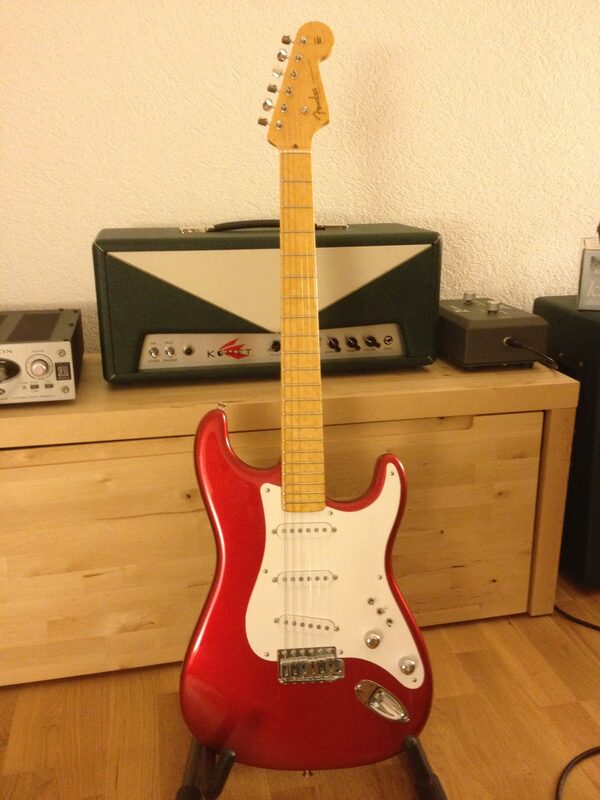 In my case, my replica is based on a Fender Custom Shop order. 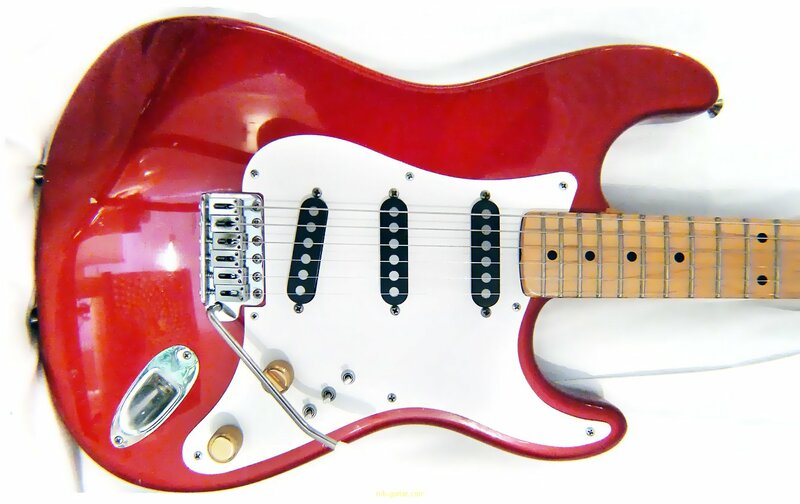 I ordered the guitar based on a Time Machine 57 NOS, Candy Apple Red over a gold base coat, bird eye maple neck with 12″ radius, 6105 frets and C-shaped. 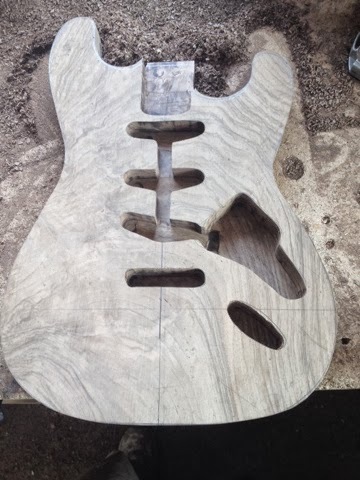 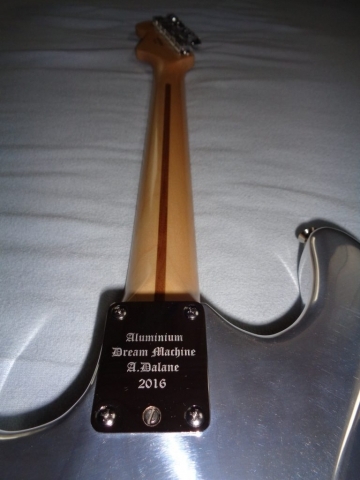 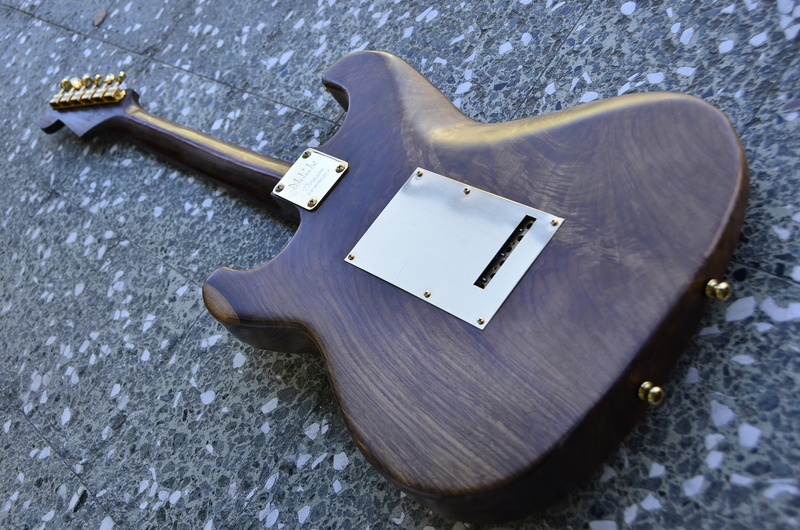 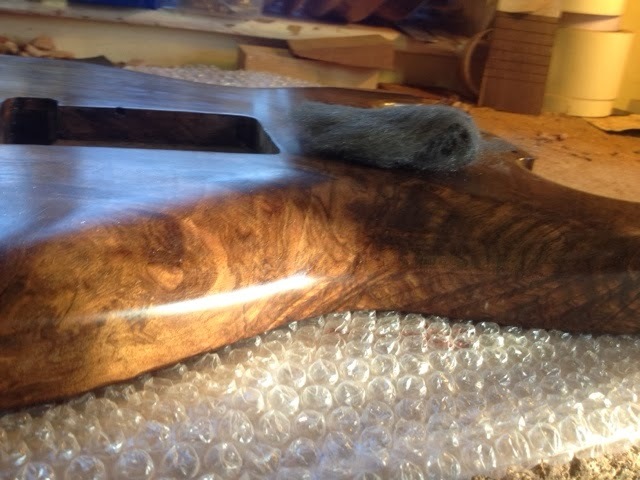 The guitar is nitro finished. 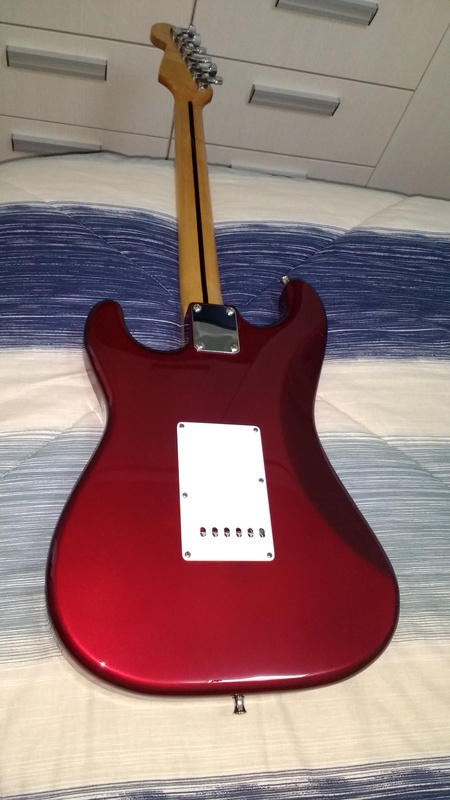 I installed Ingo’s pickguard, first the Schecter F500T pickups, but a pair of months later I decided to install the VSF-1, which I like really much more. Roland’s guitar is my old Schecter replica I sold a while back I think. 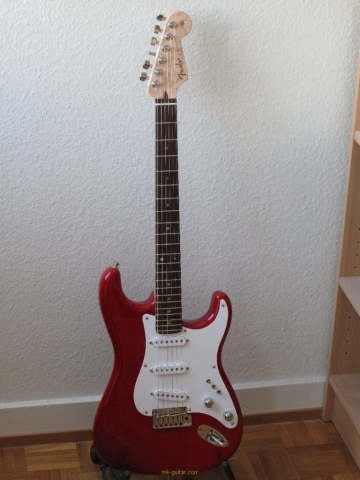 Ended up in Germany eh? Funny. Hope you are enjoying it! 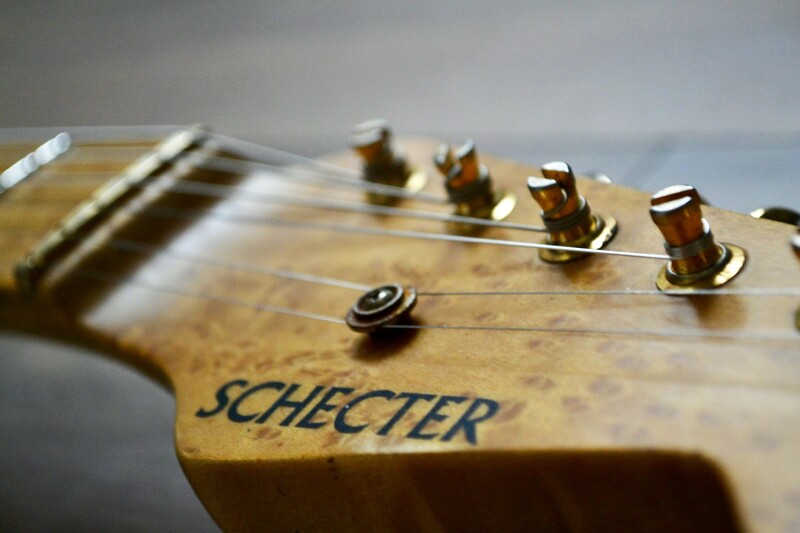 I uploaded a few pics of my “new” Schecter Dream Machine Replica as promised. I worked a loooong time on it to get it like this. 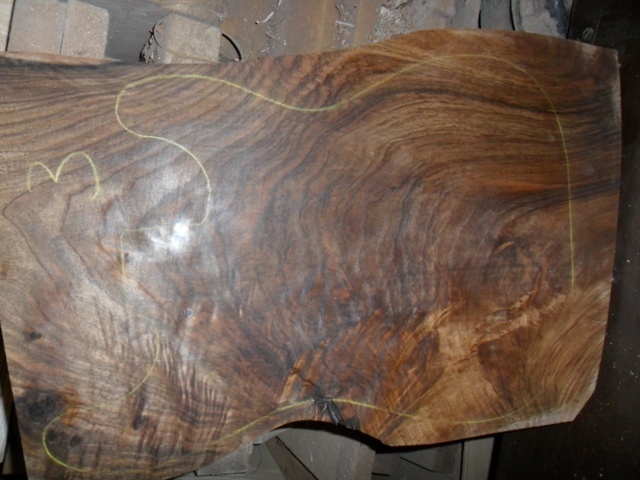 Needed a lot of sanding and some time to oil it for a “perfect” finish but it was worth the efforts! 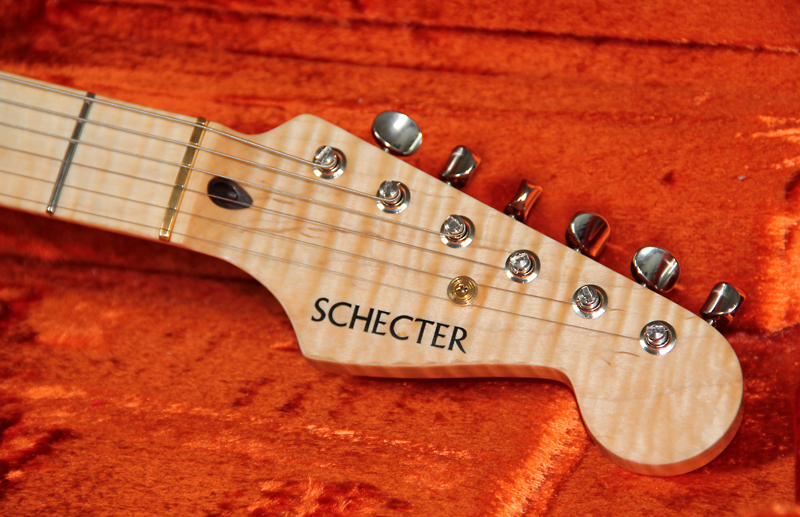 It looks and sounds just great. 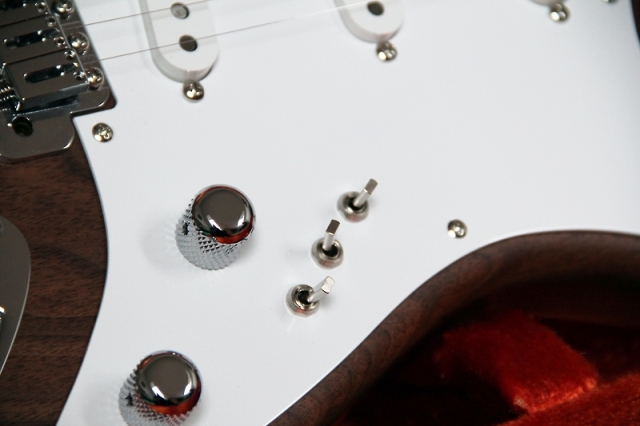 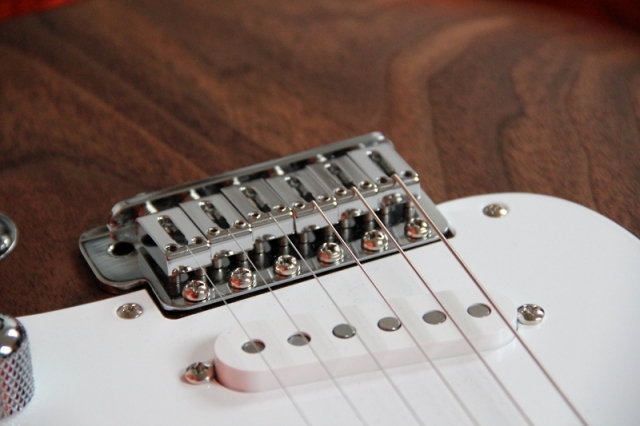 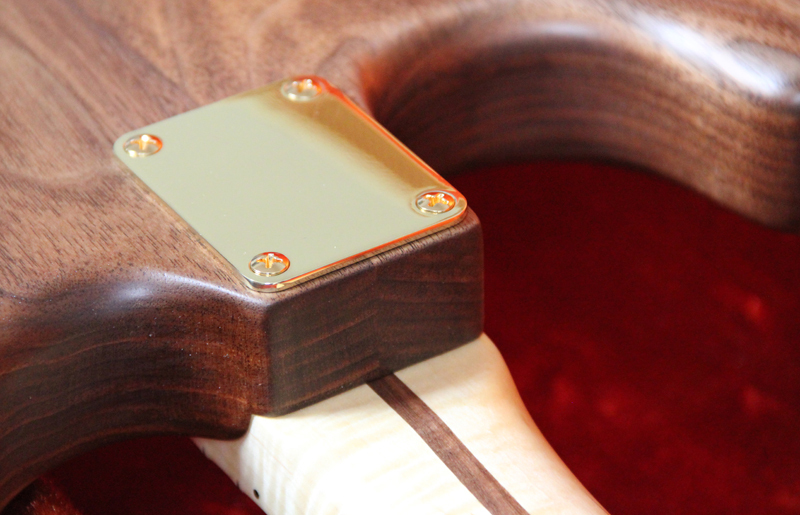 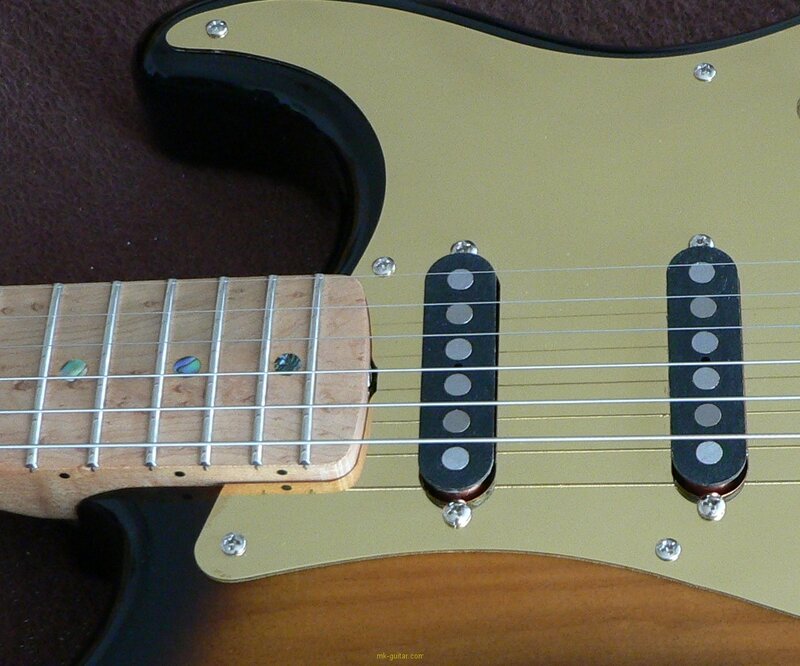 The VFS-1 pickguard is fantastic and offers a lot of different sound combinations. No matter which coils are combo’ed – on always get good sounds out of it. 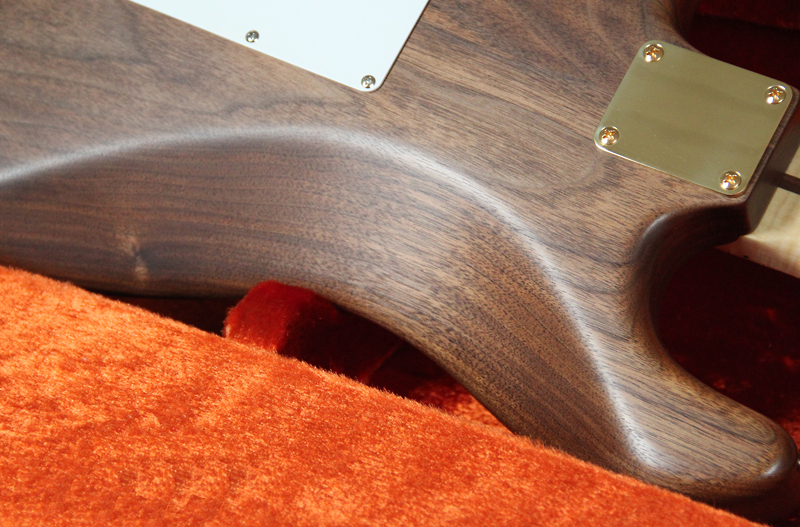 The walnut body gives very strong basses with very clear highs while the flame maple neck impart those sweet biting mids. Great for fingerstyle playing! It’s a DREAM MACHINE, indeed! i want know (if you want) how you buy your pensa custom mk1 with the signature of Mark Knopfler? 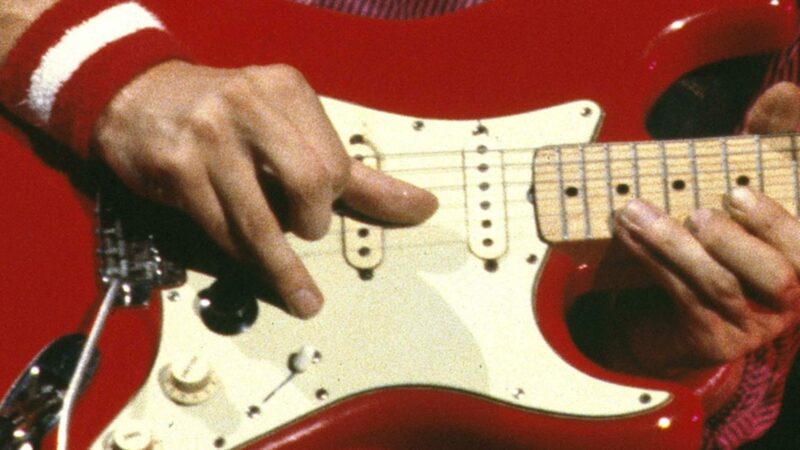 When I saw the video on youtube, i stayed surprised, because i never saw that. 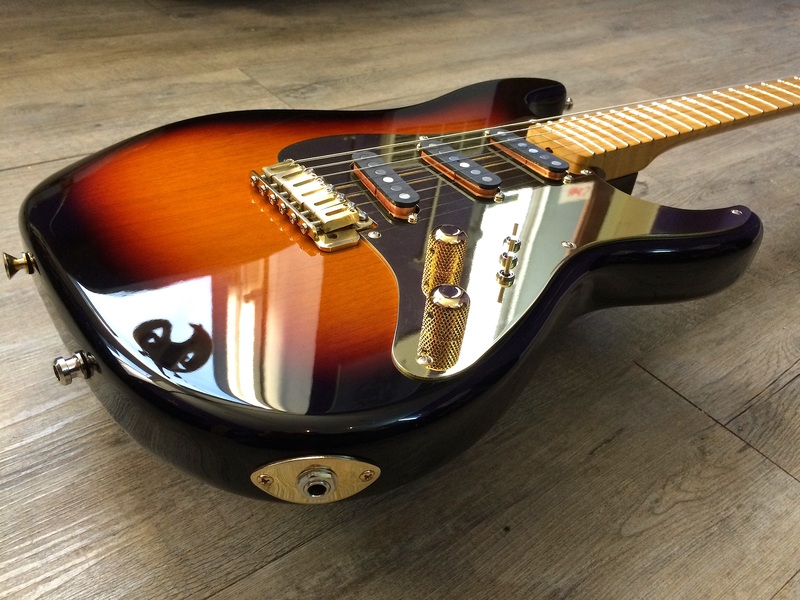 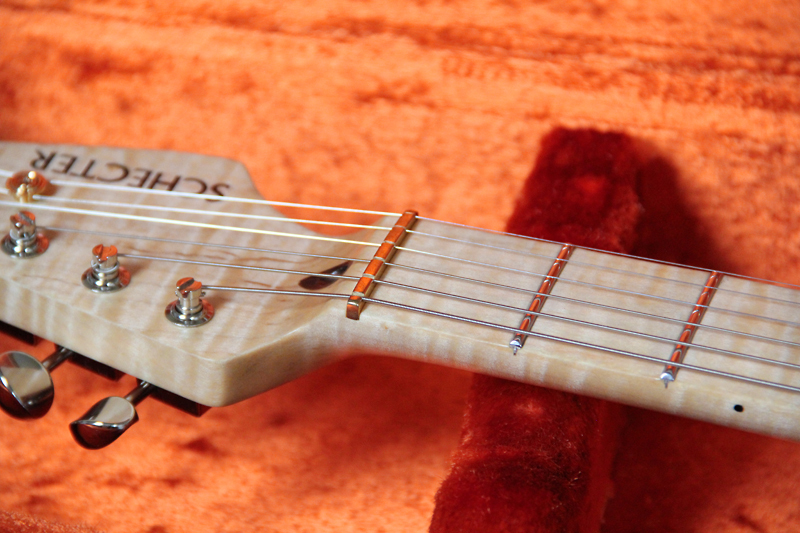 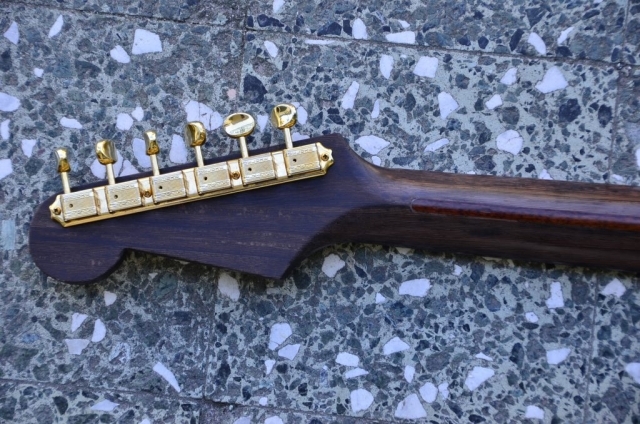 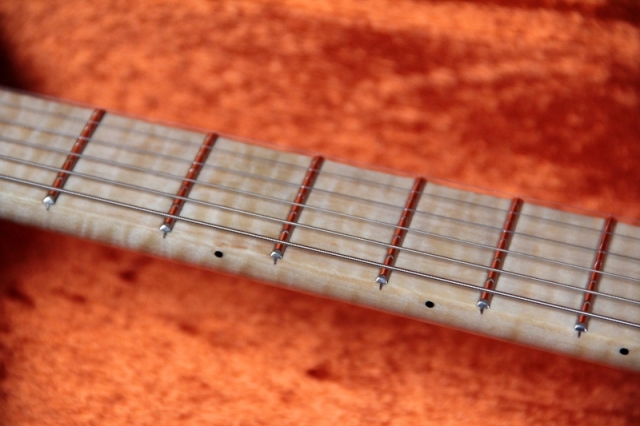 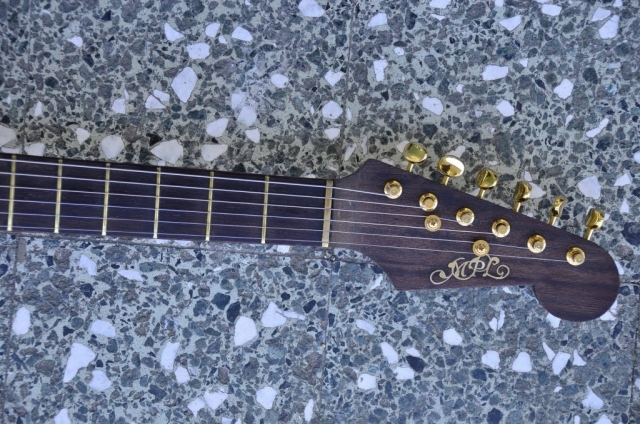 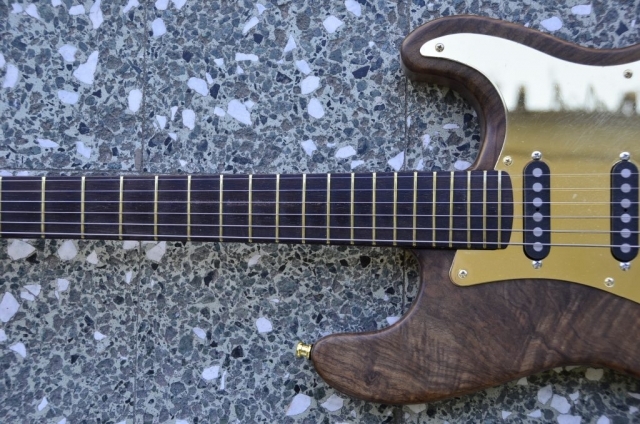 A pensa mk 1 with the signature of mk. 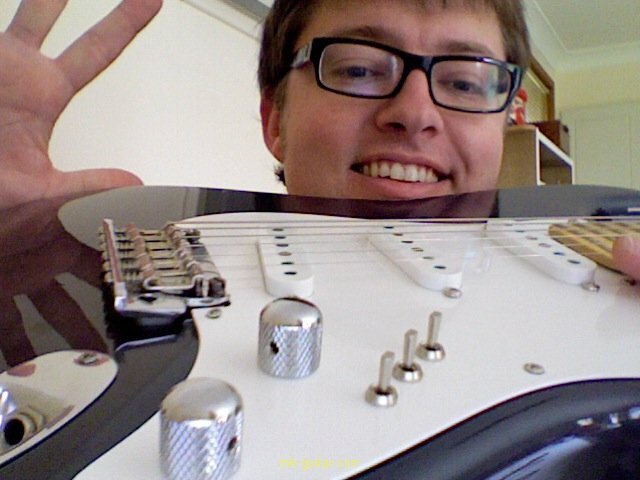 That’s not my guitar so I don’t know. 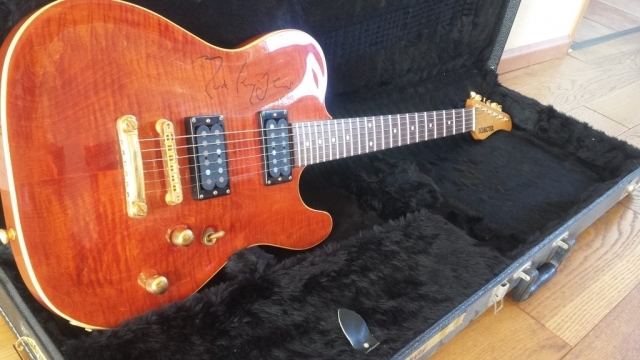 I guess the owner asked Mark to sign it. 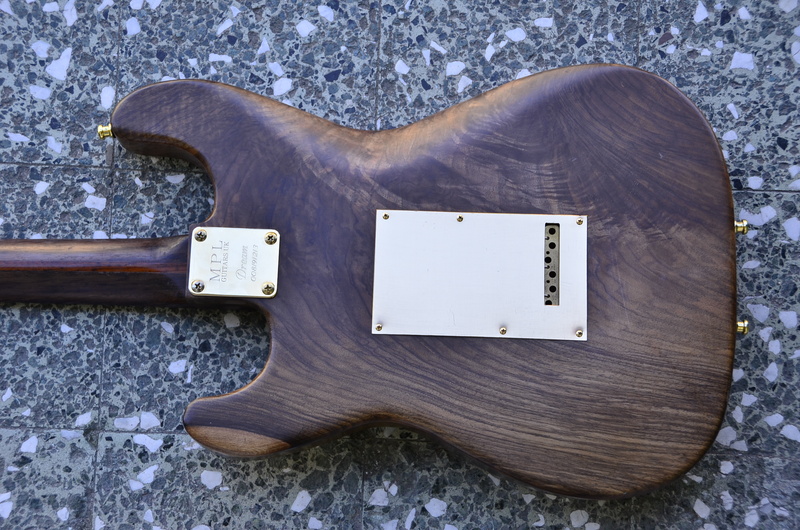 Thanks for the room Ingo, that’s a beautiful piece of english walnut worked by Mirko Pangrazzi of MPL guitars Devizes UK, following the Schecter era manufacturing philosophy .